I was intrigued by the name of this book. And I was pleasantly surprised because I worried it would be too romantic for my taste. 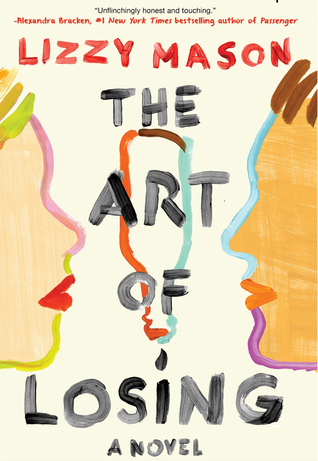 I give The Art of Losing by Lizzy Mason four out of five hearts because I was pleasantly surprised and really enjoyed it. The story is heartbreaking and the emotions it is trying to invoke come out very well. I loved the way Lizzy has written about alcohol/substance abuse without making it too heavy. She keeps it real and which probably helped with not making this novel too romantic. The author made it clear in her writing when each of the pieces of the story takes place. There is the present time and the time before the accident. Harley has a boyfriend in Mike, but he drinks too much. She tries to stop him, but never really gets to him. When Mike and Audrey, her sister, cheat on her and get into an accident. She feels betrayed by both of them and has to find a way to forgive both of them and move on with her life. Which is hard. Raf is a great distraction for Hayley and their interactions are fun to read about. They start to fall for each other and they know it. They don’t want to, because Hayley is just coming off her relationship with Mike and Raf is just back after rehab. The struggle is real for these two and they have to deal with their own issues before they can come together. It was nice to see these two grow. One of the only things I did not like about this book was the names of the characters, I kept confusing Hayley and Audrey because of the similar names and Raf is sort for Rafael (I believe), but I kept getting confused whenever his full name was mentioned whether this was Raf and I had to just assume Lizzy meant him. Overall I really loved The Art of Losing with some minor complaints. If you are looking for a great contemporary pick up this great book because you will not be disappointed. This entry was posted in Book Review and tagged Abuse, Book Review, Contemporary, Drama, Lizzy Mason, Romance. Bookmark the permalink.